Mini roundabouts and neighborhood traffic circles1 lower speeds at minor intersection crossings and are an ideal treatment for uncontrolled intersections. 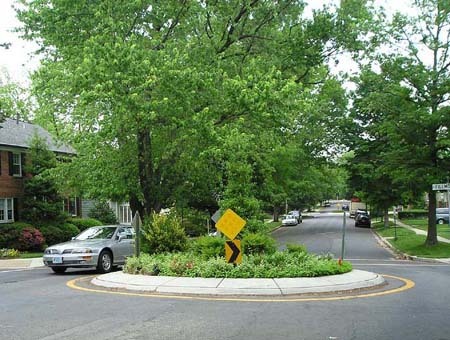 Mini roundabouts may be installed using simple markings or raised islands, but are best applied in conjunction with plantings that beautify the street and the surrounding neighborhood. Careful attention should be paid to the available lane width and turning radius used with traffic circles. 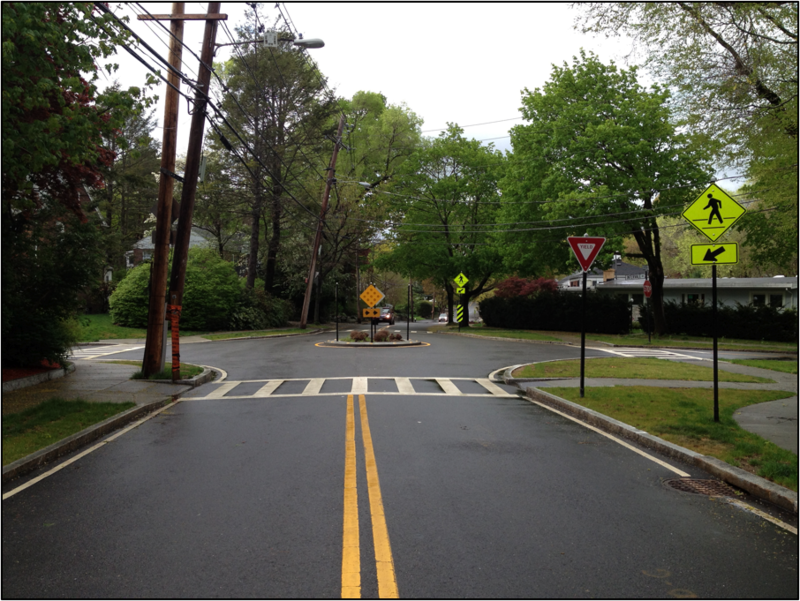 Mini roundabouts and neighborhood traffic circles lower speeds at minor intersection crossings and are an ideal treatment for uncontrolled intersections. 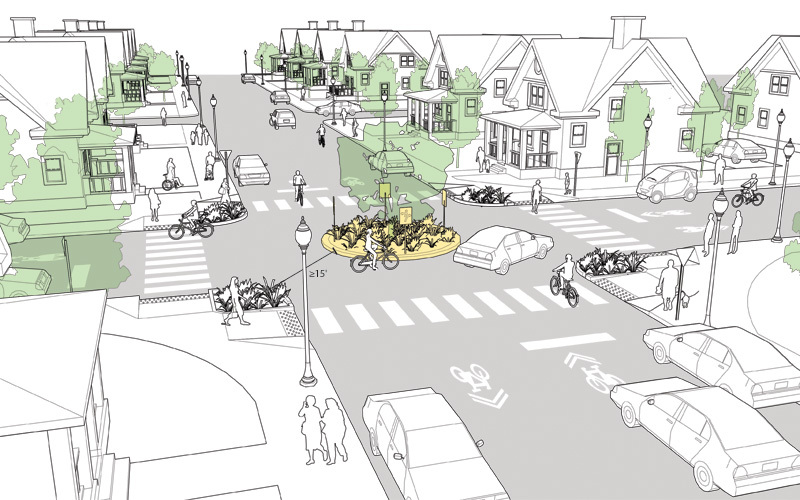 1 Mini roundabouts have been shown to increase safety at intersections. Crosswalks should be marked to clarify where pedestrians should cross and that they have priority. ADA-compliant ramps and deflector strips are required. 2 Shared lane markings or intersection crossing markings guide bicyclists through the intersection. 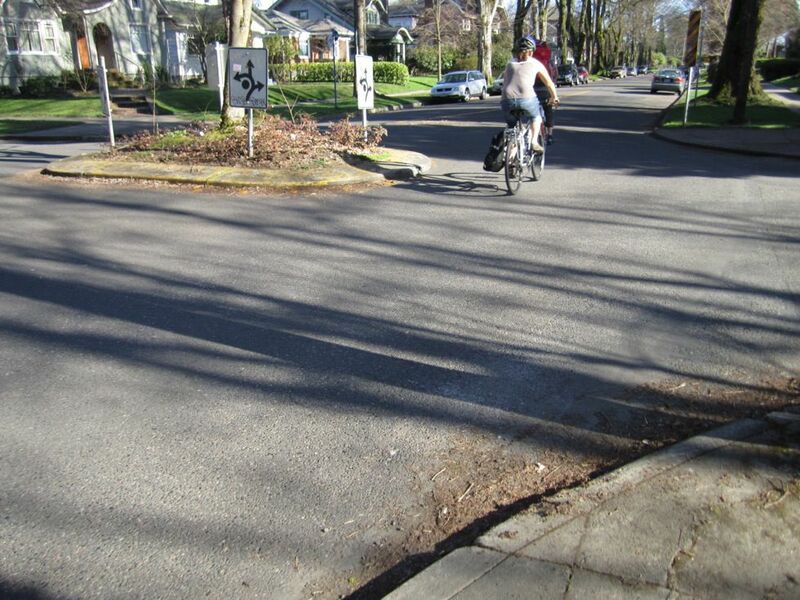 Where a bicycle boulevard turns at a minor intersection, use bicycle way-finding route markings and reinforce route direction using shared lane markings. 3 A mini roundabout on a residential street is intended to keep speeds to a minimum. Provide approximately 15 feet of clearance from the corner to the widest point on the circle. 4 Shrubs or trees in the roundabout further the traffic calming effect and beautify the street, but need to be properly maintained so they do not hinder visibility. "Mini-roundabouts are distinguished from neighborhood traffic circles primarily by their traversable islands and yield control on all approaches, which allows them to function as other roundabouts do. Neighborhood traffic circles are typically built at the intersections of local streets for reasons of traffic calming and/or aesthetics. They typically are operated as two-way or all-way stop-controlled intersections and frequently do not include raised channelization to guide approaching traffic into the circulatory roadway. 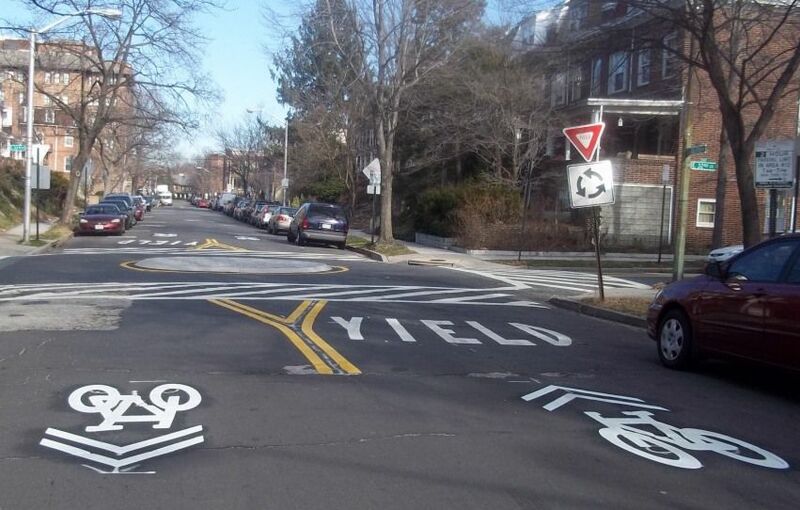 At some neighborhood traffic circles, left-turning vehicles must turn in front of the central island, potentially conflicting with other circulating traffic." Bodé, Christian, and Faber Maunsell. “Mini-Roundabouts: Enabling Good Practice.” Association for European Transport and Contributors, 2006. Federal Highway Administration. “Roundabouts: An Informational Guide.” Federal Highway Administration Report FHWA-RD-00-67 (2000): 1-277. Federal Highway Administration: Technical Summary, Mini-Roundabouts, Federal Highway Administration Report FHWA-SA-10-007 (2010). Gilbert, Gideon. "Roundabout Traffic Design and Landscaping." 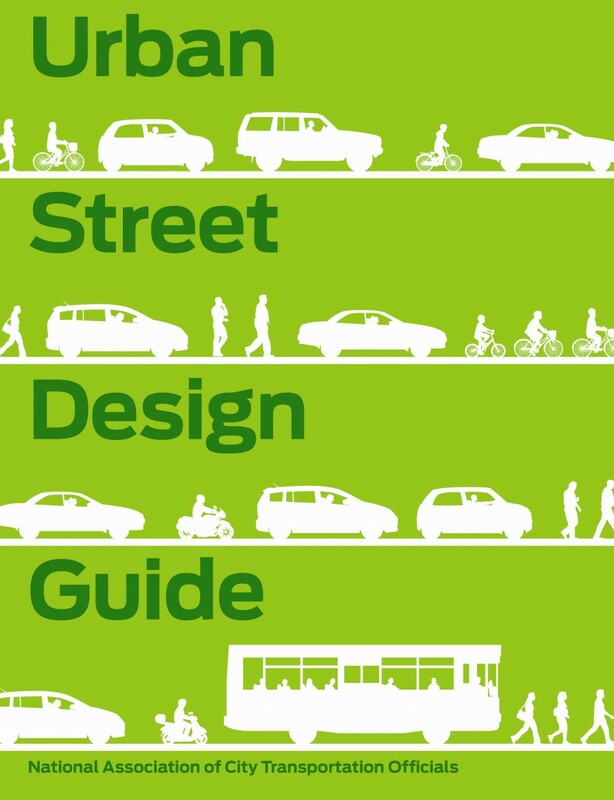 CED Engineering, Roundabouts: An Informational Guide: 183-209. NCHRP. “Roundabouts: An Information Guide.” Transportation Research Board NCHRP Report 672 (2010): 1-407. NCHRP. “Roundabouts in the United States.” Transportation Research Board NCHRP Report 572 (2007): 1-125. Sawers, Clive. "Mini-Roundabouts for the United States." ITE Journal 79 (2009): (2), 46-50. Stone, John R., KoSok Chae, and Sirisha Pillalamarri. “The Effects of Roundabouts on Pedestrian Safety.” Raleigh: Department of Civil Engineering, North Carolina State University, 2002. Tiesler, Chris, and Ed Myers. “Mini‐Roundabout Assessment-Braddock Road and Pleasant Valley Road.” Kittelson and Associates, Inc. 2013. Waddell, Edmund, and James Albertson. "The Dimondale Mini: America’s First Mini-Roundabout." Presented at the Transportation Research Board International Conference on Roundabouts, Vail, Colorado, May 2005. References for Mini Roundabout: 8 found. Sawers, Clive. 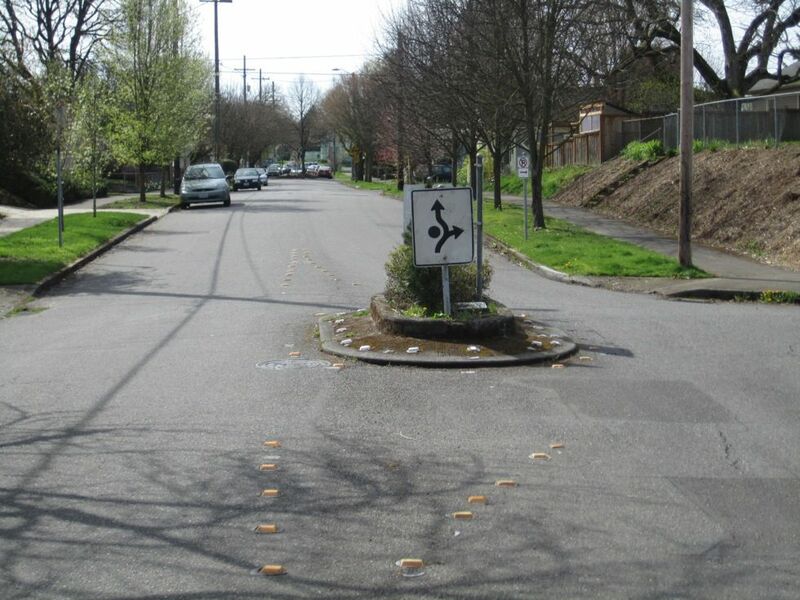 "Mini-Roundabouts for the United States." ITE Journal 79 (2), 46-50, Institute of Transportation Engineers, Washington, DC. Federal Highway Administration. "Mini-Roundabouts Technical Summary." Office of Safety Programs, Federal Highway Administration Report FHWA-SA-10-007, Washington, DC. Bodé, Christian, & Maunsell, Faber. 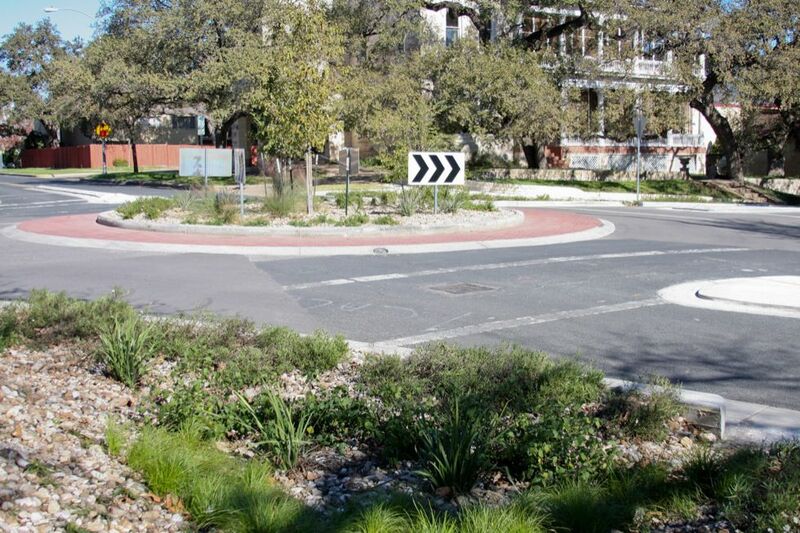 "Mini-Roundabouts: Enabling Good Practice." European Transport Conference 2006, Association for European Transport, Henley-in-Arden, EN. Tiesler, Chris, & Ed Myers. 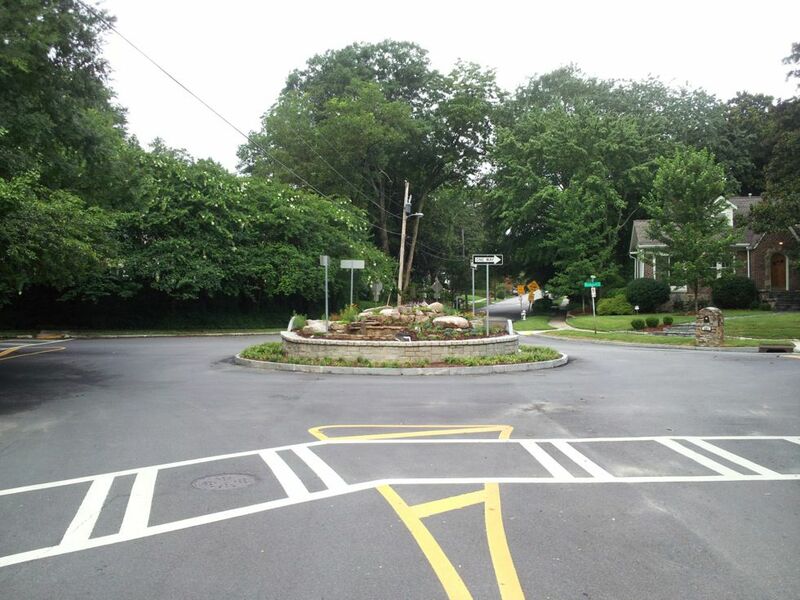 "Mini‐Roundabout Assessment-Braddock Road and Pleasant Valley Road." Prepared for Virginia Department of Transportation, Kittelson and Associates, Inc., Reston, VA.
Gilbert, Gideon. 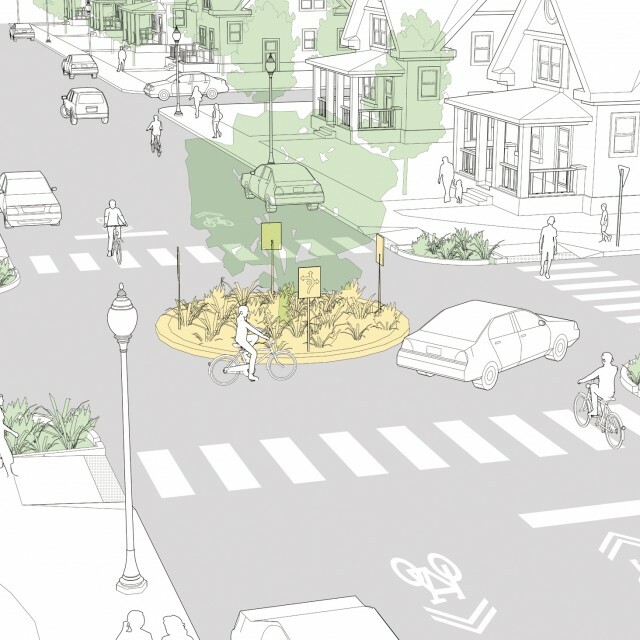 "Roundabout Traffic Design and Landscaping." 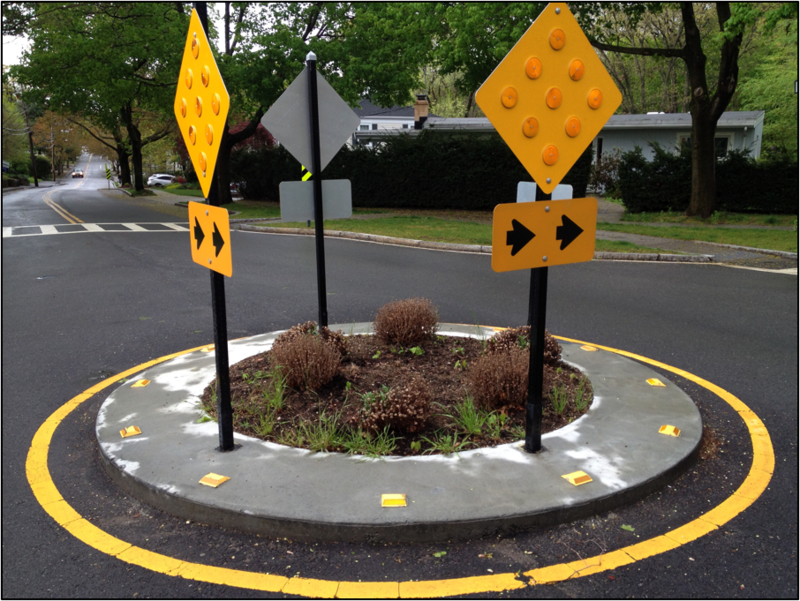 Roundabouts: An Informational Guide, CED Engineering, Inc., Stony Point, NY. Robinson, Bruce et al. "Roundabouts: An Informational Guide." NCHRP Report FHWA-RD-00-67 1-277, Federal Highway Administration, McLean, VA.
Waddell, Edmund, and James Albertson. "The Dimondale Mini: America’s First Mini-Roundabout." Presented at the TRB International Conference on Roundabouts, Transportation Research Board, Vail, CO.
Stone, John R, KoSok Chae, & Sirisha Pillalamarri. 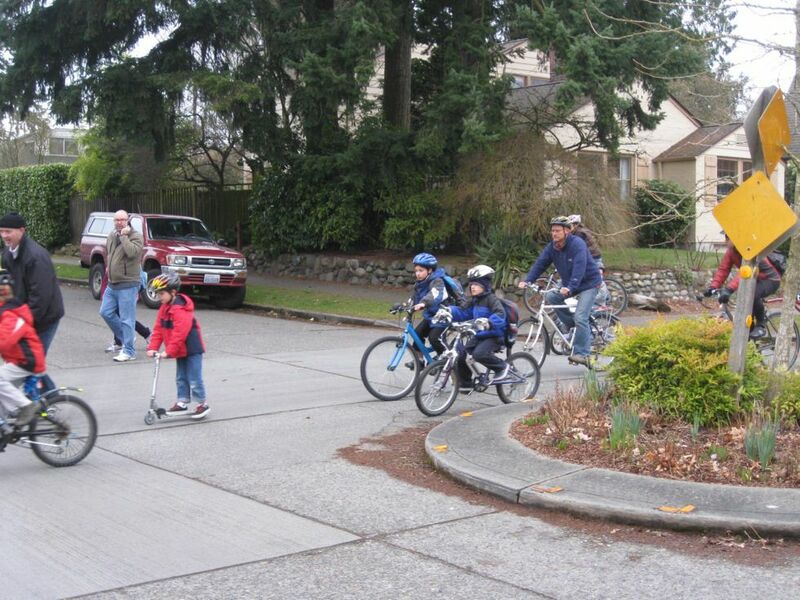 "The Effects of Roundabouts on Pedestrian Safety." Department of Civil Engineering, North Carolina State University, Raleigh, NC.